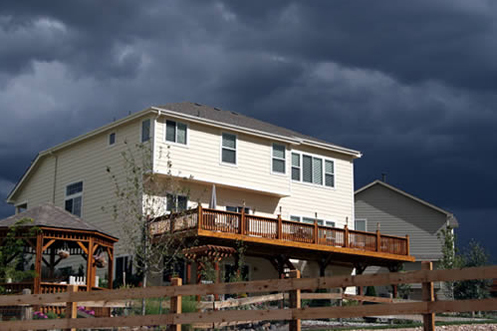 The storm windows on your house protect the property from damages that could potentially occur, such as damages from strong storms and also from intruders trying to enter the property. However, if, after several years, the current storm windows on the property are no longer functioning as they once were or if the glass becomes broken, you will need to begin considering your options. While you can certainly choose replacement storm window shutters in updated designs, you also have the choice to replace the storm window panes for a lower expense. While the replacement of panes won't be the best option for all property owners, it can certainly be a choice that is worth your consideration before making a final selection. There are many reasons why you may decide to move forward with the replacement of storm window panes in the property that you own. First, if you have recently suffered storm damage on the property which broke the current window panes, you will need to proceed with the replacement project as soon as possible. In this type of situation, the glass on the windows was likely the only major damage that occurred. As such, the frames are likely still in great condition and can continue functioning properly on the house after the replacement panes are installed. Another benefit that many property owners experience from installing new storm window panes is no longer dealing with older panes that didn't fit properly into the frames. In situations such as this, rattling can occur with the older panes, which can really become a nuisance for you as a property owner. However, after the new glass is properly and tightly secured into the frames, this is an issue that you will no longer need to deal with. Finally, by selecting new glass styles that are also designed to promote energy efficiency, you can do more for the environment as a property owner. Additionally, with energy efficiency styles, you may even begin to notice a positive impact on the utility bills in the property, which will result in lower household costs for you after the replacements are completed. Finally, one of the greatest benefits that property owners are often able to experience from replacing storm window panes is paying lower expenses than they otherwise would have when buying completely new storm windows to replace the old ones. There are many things to consider when it comes to replacing panes for your storm windows. First, consider the material from which the storm window frames are made. This is an important consideration because it will determine the manner in which you will need to proceed with the pane replacement project. Also, assess the sealing techniques that were utilized with the original panes so that, again, you will be able to proceed with removing the old ones and inserting the new ones in the best manner possible. Since replacing storm window panes is meant to improve the safety and energy efficiency of the property, be sure that you insert the new panes properly and seal them tightly into the frames. This is essential since it will prevent the new panes from rattling and will also ensure that the storm windows continue functioning properly for the residence. Also, when selecting replacement panes, be sure to select high quality and thick glass options so that you can increase the energy efficiency levels of the residence where you live. These and other steps should ensure that the replacement pane project goes well for you.